It is the year 2010 AD. All encyclopedias have been made obsolete by Wikipedia. All of them? Not quite! One publisher with a creative management team still systematically continues to publish Germany's most important historical encyclopedia: Der Grosse Ploetz. And not only that – now smaller versions derived from Der Grosse Ploetz have started to appear too. The first of these products is the Gesamtchronik der Weltgeschichte (Chronicle of World History). A Deutschland-Ploetz and other works, both electronic and printed, are in the pipeline. 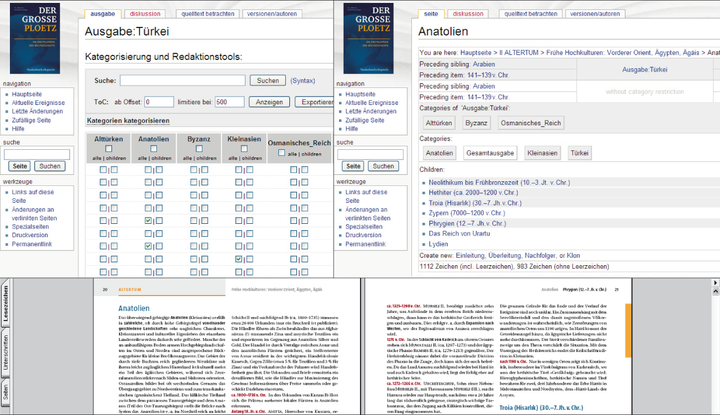 Since 2009, all the data records have been managed in a wiki, equipped by le-tex with an online editor, a full text search, and a self-developed edition management system. The InDesign XML format IDML is generated on the server side from the wiki export of an edition and then provides rough page makeup for size estimation and also serves as a basis for the print and online PDF. Other target formats for conversion are Word, EPUB, and in future possibly Ploetz apps with interactive added value. The Mediawiki software developed for Wikipedia is used in this project as a pure back-end tool for editing, in order to continue developing a carefully copy-edited, encyclopedic data set innovatively and cost-effectively. Ironically, this also serves to ensure long-term market competitiveness, with Wikipedia being one of the key competitors.